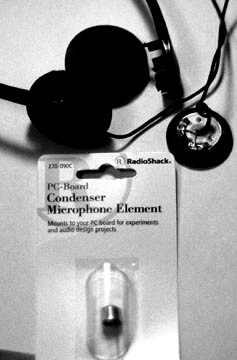 You can build a decent stealth headphone mic with the mic elements Radio Shack sells. The finished mic works well with "plug-in power" mic jacks like those on most Sharp and Sony portable minidisc recorders. Disassemble the ear pads and speakers in the earphones. Note the two wires that are attached to each of the headphone speakers. One of the wires will be colored (usually red for right and white or black for left) and one wire will be bare. Heat the red and bare wires with the soldering iron where they are attached to the speakers until you are able to remove them. Discard the speakers. Annoyingly, you have to switch the wires to preserve the correct stereo image. Solder the bare wire from the left headphone speaker to the ground wire on the mic element that will be installed in the right earphone. Then solder the colored wire from the left headphone speaker to the Output, V+ terminal of the right mic element. Using the soldering iron, melt a hole large enough to accomidate the mic element in the headphone. This hole will be covered with the foam ear pads when the headphones are reassembled. Take care to make sure to knot the wires inside the earphones so there is no direct stress on the mic elements. When the headphones are reassembled, the wires should be snug--if they move it will create noise. Superglue the right mic element in place, repeat the process for the left mic element, then reassemble the earphones using superglue as necessary. While its tempting to record with these "on the move" I get the best results when the headphones are stationary. The mics seem prone to picking up wind noise, cable movement, as well as the sounds of rustling clothing, etc. The overall quality of the recordings seem comparable to my $100 (list price) Sony ECM-MS907 stereo mic, not bad for $4! I've made some binarual mics for my MD701. I used a matched pair of 3mm capsules (whose performance is much the same as the 8mm ones) mounted in some old sony earbuds. The great thing was that the earbuds had a 3mm port in the back so the capsules fitted this perfectly. I packed the cavity with blue tack (plastercine-like adhesive gum, I think you call it something else in the states). I made a seperate biasing circuit housed in an empty 35mm film container (using a 9V battery). The performance is exceptional. The first time I recorded some of my friends sitting in my lounge chatting, I turned around when I played it back even though they were by then sitting in front of me. I got totally confused for an instant. I've used the set up to record a Celtic jam session and also in Peru recently to record street sounds and a new friend playing guitar. All great fun. I think ear buds are more suitable for "on the head" binaural recording, because to some extent they preserve the effects of the pinnae. The "stealth" aspect is cool too, although you look pretty suspicious in a concert wearing earphones. Taking Felix's suggestion I built another stealth mic with Panasonic WM60AY mic elements (available from Digikey) instead of the Radio Shack elements. The Panasonic elements are smaller and fit nicely in an old set of earbud style headphones I got for free with a case of cassette tapes. It makes a very low profile mic. The Panasonic elements, while having much better sensitivity and flatter response than the Radio Shack elements, are also much harder to work with. There are no leads already soldered and the points to which you solder the wires are very small. Tidmarsh Major's page offers helpful tips on soldering the Panasonic capsule mic elements. 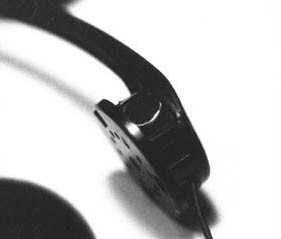 David Simpkins has a page describing his work with binaural recordings. Niels Linneberg has a page describing how to build a mono mic that mounts directly on a minidisc recorder. 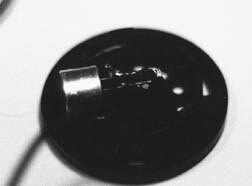 Tidmarsh Major has a page on binaural mic construction including plans for a 9V power supply (a good thing to have if you are recording loud sound sources). 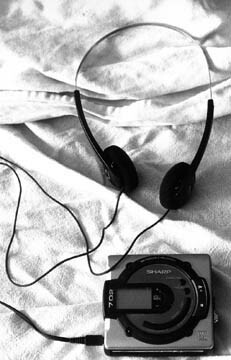 The Minidisc Community has a homemade mic construction page;. The Mic DIYer's homepage and mailing list.